A number of white flowering azaleas are available for sale in Australia. Many have magnificient pure white flowers, very popular at weddings. The varieties do differ in growth habit and in growth requirements, some requiring more shade than others. Some larger growing while others have a compact ‘dwarf’ habit such Azalea indica ‘Aline’, pictured right. So what are the best white flowering azaleas for the garden? Choose the best variety for size and location. This is a tall growing plant to nearly 2m, however Azalea indica ‘alba magnifica’ can easily be pruned to shape. 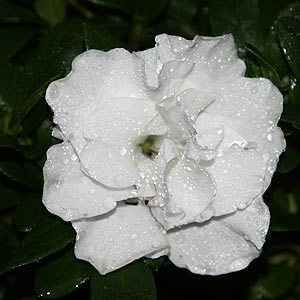 Flowers are single and pure white with a slight fragrance. A little more sun tolerant than some others. Excellent in the garden border and as it is a vigourous plant it can also be used as a standard. Also well suited to container growing. The main flower flush is in late spring, however it will flower through the year. This is a compact growing form with double white flowers appearing from autumn right through winter to spring and early summer. Reaching around 70cm in height and with large attractive deep green foliage Azalea ‘Aline’ make a great specimen in a container where its long flowering habit adds interest through the cooler months. Also excellent in the garden border, or planted as a low growing hedging plant. Best in part shade in a humus rich moist soil. This is a Satsuki hybrid, one of the lowest growing of all, single wh ite flowers sometimes with a touch of pink from spring through summer. The foliage is small and White Gumpo will reach around 30cm and has a bushy habit. Largewhite flowers in spring to summer, low growing a nice spreading habit.